While there's already a lot of enthusiasm built up over The Avengers: Age Of Ultron, Marvel's other release for 2015, Ant-Man, is slowly building up its own train of hype. For a film that started to look like it wasn't going to happen at all, or at the very least be severely delayed from its original release target, it's a feat of almost superheroic proportions that there's even still an Ant-Man movie to look forward to. It's also a pleasant surprise to actually see footage from the currently in production film, which is what comic fans got last night, thanks to a TV special covering the Marvel legacy. Last night, ABC ran a prime time special dedicated to Marvel Comics and their transition "From Pulp To Pop." Among the footage that was used (and captured in HQ, thanks to CBM Trailers) , naturally, were looks at The Avengers: Age Of Ultron and Ant-Man. While past events of such a nature would show concept art for a film that was uber secretive and still in production, last night's special was privy to a look into some early footage from the Peyton Reed directed film that caps off Phase 2 of Marvel's Cinematic Universe. What we got to see wasn't much visually, but as you'll see in our analysis, there's a lot at work in the mere seconds of footage. Our very first public glimpse of Ant-Man is a scene in what looks like Hank Pym's workshop, between Michael Douglas' older depiction of the Marvel genius/original Ant-Man and Paul Rudd's younger, new heir to the suit, Scott Lang. While we're not given any audible dialogue, it looks like what we're watching is the introduction to Pym's famous "Pym Particles" formula – the chemical process that makes the reduction and restoration of anyone wearing the suit possible. What we wouldn't give to hear that scientific jargon coming from Douglas' lips in this scene, particularly now that the script for the film is a sort of hybrid between Adam McKay and original co-writer/director of Ant-Man, Edgar Wright. 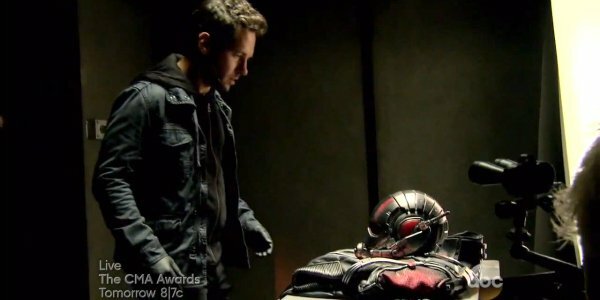 The next, and final, glimpse we got into the mysteries of Ant-Man, is Scott Lang laying eyes on the suit, presumably for the first time. Despite the previous scene with Paul Rudd and Michael Douglas, this looks like it happens before the scene that occurs between those two. In fact, judging by the gloves Rudd is wearing, and the fact that his character has been recently named as "master thief" in the plot synopsis, it's a good bet to wager that this is a scene that happens closer to the beginning of the film – a scene that shows Scott Lang stealing the Ant-Man suit, much like Eric O'Grady did in his incarnation. With Ant-Man coming to theaters on July 17, 2015; here's hoping we'll see a lot more of Scott Lang's heroics and snark before the year is out!